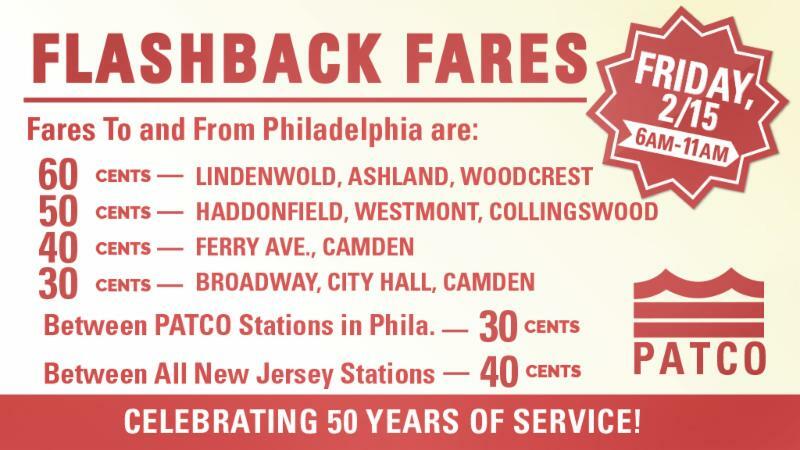 PATCO to celebrate 50th Anniversary by offering “Flashback Fares” from 1969 during morning rush hours of Friday, 2/15. On February 15, 1969, PATCO made its first trip from Lindenwold, New Jersey, to Center City Philadelphia. To mark PATCO’s 50th anniversary, riders will be able to travel on PATCO and pay the 1969 fares from 6am-11am on February 15. In addition, a festive event, complete with a cookie giveaway and DJ, will be held at the Woodcrest Station from 7 a.m. to 9 a.m. on February 15. Officials will make remarks to mark the start of celebrating PATCO's anniversary. Employees will be at eight New Jersey stations (Lindenwold to Broadway) from 7 a.m. to 9 a.m. on February 15 handing out a commemorative reproduction of the original timetable from 1969. This event kicks off a year-long customer appreciation celebration with similar events being held once a month at different stations.